In the Media — I have IBS. Now what?!!! Media Interview by Self.com. Here’s When to See a Doctor About Diarrhea and When to Wait for It to Pass. By Korin Miller. July 17, 2018. https://www.self.com/story/when-to-see-doctor-diarrhea. Symptoms Of Crohn’s Disease That Should Not Be Ignored. 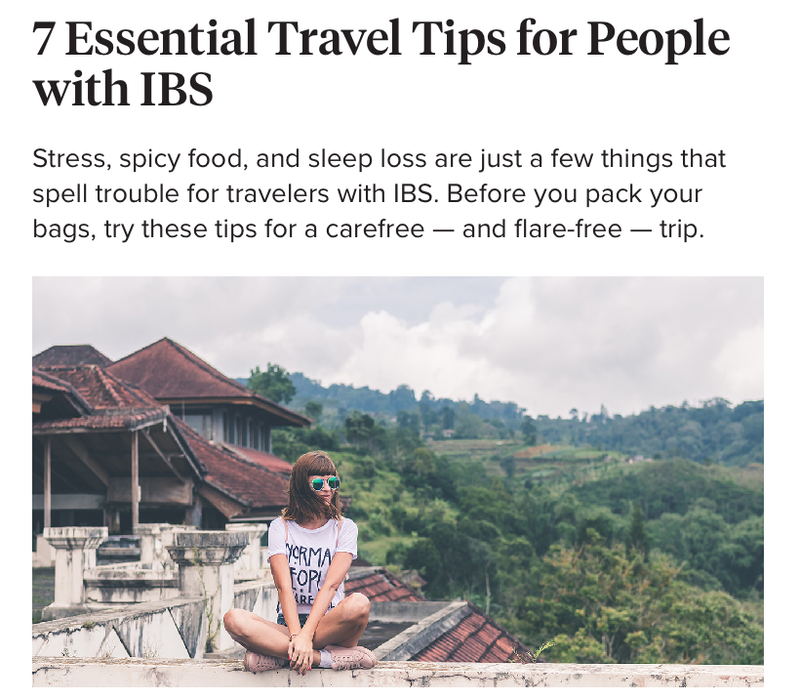 7 Essential Travel Tips for People with IBS. 10 Crohn’s Disease Symptoms, From Diarrhea to Beyond. 12 Colonoscopy Prep Tips From Gastroenterologists to Make the Whole Thing Less Hellish. 6 Symptoms Of IBS That Most People Ignore. Why You Seriously Need to Stop Taking Your Phone Into the Bathroom. Media Interview by Self.com. How to Tell the Difference Between IBS and IBD. By Korin Miller. Jan 28, 2017. 7 Ways Pain Is Sometimes Misdiagnosed. Media Interview by USNews.com. 7 Ways Pain Is Sometimes Misdiagnosed. By Ruben Castaneda. Jan 22, 2018. Gastroenterologists Share 7 Things to Do When You Have Painful Gas. Media Interview by Self.com. Gastroenterologists Share 7 Things to Do When You Have Painful Gas. By Korin Miller. Dec 14, 2017. Here’s Why Your Poop Can Be So Freaking Weird on Your Period. Media Interview by Self.com. Here’s Why Your Poop Can Be So Freaking Weird on Your Period. By Korin Miller. Dec 9, 2017. Media Interview by Women’s Health. These 4 Underlying Conditions Might Explain Why Your Stomach Hurts After You Eat. It's not always just indigestion. By Korin Miller. Nov 15, 2017. Media Interview by Women’s Health. 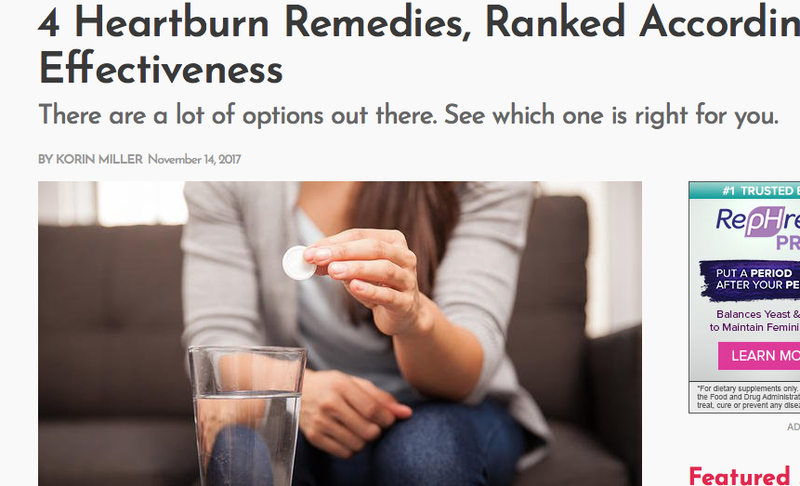 4 Heartburn Remedies, Ranked According To Effectiveness. There are a lot of options out there. See which one is right for you. By Korin Miller. Nov 14, 2017. Media Interview by Healthline.com. Does a Healthy Gut Equal a Long, Healthy Life?…By Jim Pietrangelo on November 5, 2017. Media Interview by Self.com. Sean Hayes Emergency Surgery …By Korin Miller. Oct 26, 2017. Media Interview by Womaeshealthmag.com. 6 Signs You Should See A Poop Doctor ASAP. By Korin Miller. Oct 12, 2017. Media Interview by Bustle.com. What These 13 Subtle Bodily Changes Can Tell You About Your Health. By Carolyn Steber. Oct 3, 2017. Media Interview by Self.com. Stress Diarrhea and Constipation: Why Stress Messes With Your Poop. By Korrin Miller. Aug 25, 2017. Media Interview by Glamour. This Is Why You Always Have Movements Around the Same Time. By Korrin Miller. Jun 22, 2017. .comTwo Media Interviews by Prevention and Men's Health. 8 Breakfasts That Will Make You Bloated Every Time. By Mary G. Taylor. Jun 15, 2017. Media Interview by Healthline. Does the Squatty Potty Really Make it Easier to Go? By Rena Goldman. Dec 06, 2016. Media Interview by Mic. Do Lactaid pills really work? The truth about having milk when you're lactose intolerant. Media Interview by Reader’s Digest. 11 Symptoms of Crohn’s Disease You Might Be Ignoring. By Lisa M. Conklin. 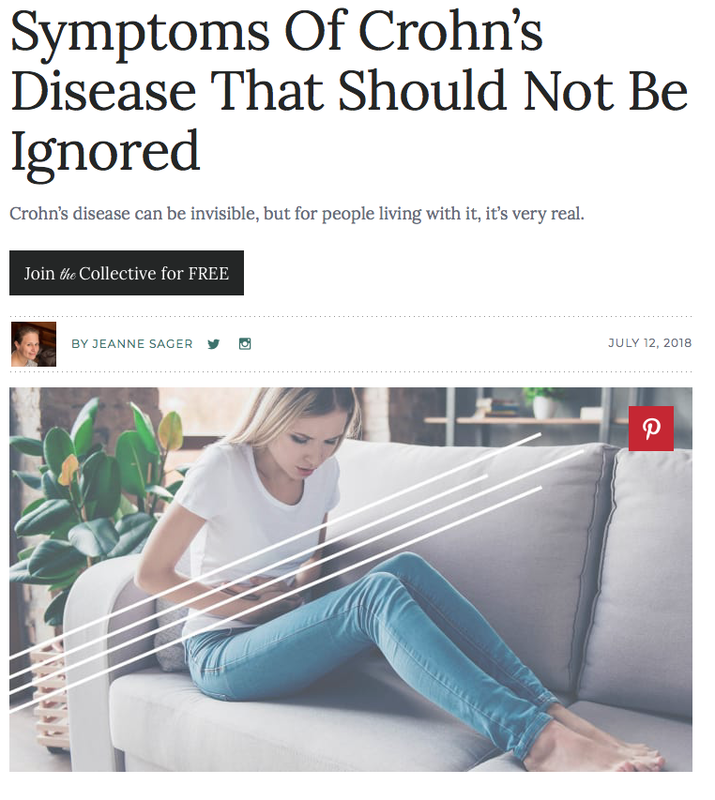 Is It Crohn's Flare? How to Spot the Signs? Media Interview by Everyday Health. Is It a Crohn’s Flare? How to Spot the Signs. By Beth W. Orenstein. Aug 2, 2016. Podcast in A Weekly Dose of Wellness. Keeping Your Colon Healthy. Media Interview by Everyday Health. All in the Family: Is Ulcerative Colitis Genetic? By Beth W. Orenstein. Oct 23, 2014. Media Interview by Becker’s. 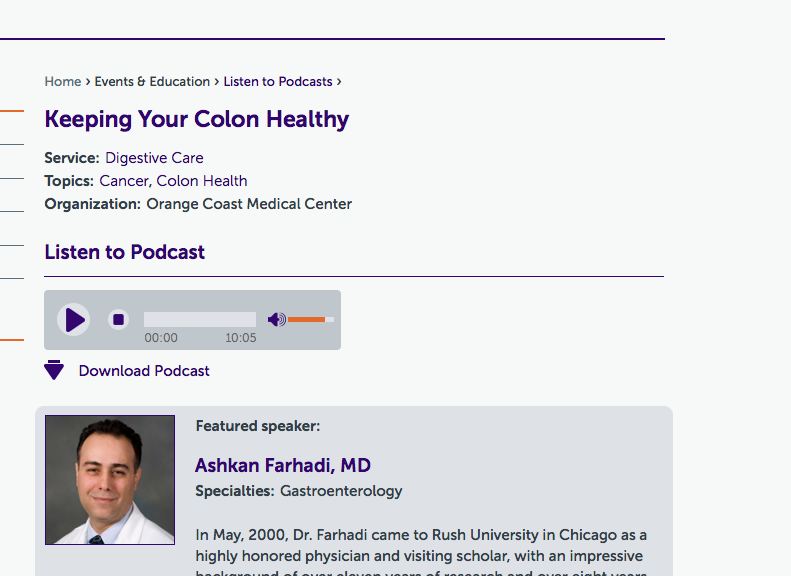 New GI technology: 10 gastroenterologists on the most exciting advancements. By Carrie Pallardy. Sep 26, 2014.